An Object for handling remote calls. Instances of the MethodInvocation class are used when handling D-Bus method calls. It provides a way to asynchronously return results and errors. 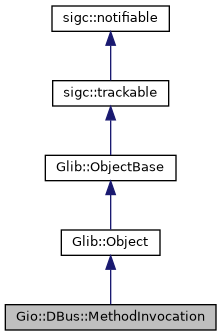 The normal way to obtain a MethodInvocation object is to receive it as an argument to the SlotMethodCall that was passed to Gio::DBus::Connection::register_object(). Gets the Gio::DBus::Connection the method was invoked on. A Gio::DBus::Connection. Do not free, it is owned by invocation. Gets the name of the D-Bus interface the method was invoked on. If this method call is a property Get, Set or GetAll call that has been redirected to the method call handler then "org.freedesktop.DBus.Properties" will be returned. See DBusInterfaceVTable for more information. A string. Do not free, it is owned by invocation. Gets the Gio::DBus::Message for the method invocation. This is useful if you need to use low-level protocol features, such as UNIX file descriptor passing, that cannot be properly expressed in the Variant API. See this [server][gdbus-server] and [client][gdbus-unix-fd-client] for an example of how to use this low-level API to send and receive UNIX file descriptors. Gio::DBus::Message. Do not free, it is owned by invocation. Gets information about the method call, if any. If this method invocation is a property Get, Set or GetAll call that has been redirected to the method call handler then nullptr will be returned. See g_dbus_method_invocation_get_property_info() and DBusInterfaceVTable for more information. A DBusMethodInfo or nullptr. Do not free, it is owned by invocation. Gets the name of the method that was invoked. Gets the object path the method was invoked on. Gets the parameters of the method invocation. If there are no input parameters then this will return a GVariant with 0 children rather than nullptr. A Variant tuple. Do not unref this because it is owned by invocation. Gets the bus name that invoked the method. Finishes handling a D-Bus method call by returning an error. This method will take ownership of invocation. See DBusInterfaceVTable for more information about the ownership of invocation. error_message A valid D-Bus error message. Like g_dbus_method_invocation_return_error() but without printf()-style formatting. domain A Quark for the Error error domain. Like g_dbus_method_invocation_return_error() but takes a Error instead of the error domain, error code and message. Finishes handling a D-Bus method call by returning parameters. If the parameters GVariant is floating, it is consumed. It is an error if parameters is not of the right format: it must be a tuple containing the out-parameters of the D-Bus method. Even if the method has a single out-parameter, it must be contained in a tuple. If the method has no out-parameters, parameters may be nullptr or an empty tuple. Since 2.48, if the method call requested for a reply not to be sent then this call will sink parameters and free invocation, but otherwise do nothing (as per the recommendations of the D-Bus specification). parameters A Variant tuple with out parameters for the method or nullptr if not passing any parameters. Like g_dbus_method_invocation_return_value() but also takes a UnixFDList.